Sedimentation is a natural phenomenon with no quality issue. Shake well before use. Keep refrigerated after opening and consume shortly thereafter. 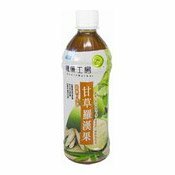 Ingredients: Water, Sugar, Grosvener Siraitia (Luo Han Guo) Extract, Lophatherum Extract, Lotus Leaf Extract, Antioxidant (E300), Licorice Extract, Acidity Regulator (E334), Sweetener (Steviol Glycosides). Simply enter your details below and we will send you an e-mail when “Licorice & Grosvener Siraitia (Luo Han Guo) Drink (健康工房甘草羅漢果飲品)” is back in stock!